Home ABOUT ETHANOL FIREPLACES What to light bio fireplace with? Unlike in traditional fireplaces, while lighting a ethanol fireplace rapid fuel ignition occurs in a large open space. How should we protect our hands from unwanted burns? Most burners in ethanol fireplaces are open, and the fuel is poured directly into it. In most cases there are no intermediate chambers restricting the access to the full flammable liquid tank. Contact of the fuel with the fire causes instant ignition of the entire open surface of the tank. In most ethanol fireplaces an opening in the burner, through which we have an unlimited access to the fuel, is quite big. Instant fuel ignition over the entire surface of the opening will certainly result in burns. Because we will not have time to move the hand into a safe place. The fire spreads over the clearance of the open burner extremely fast. Taking into account the above-mentioned details we absolutely must not light the fuel with an ordinary lighter, match or a rolled piece of paper. We would have to move a hand too close to an open tank with flammable fuel. 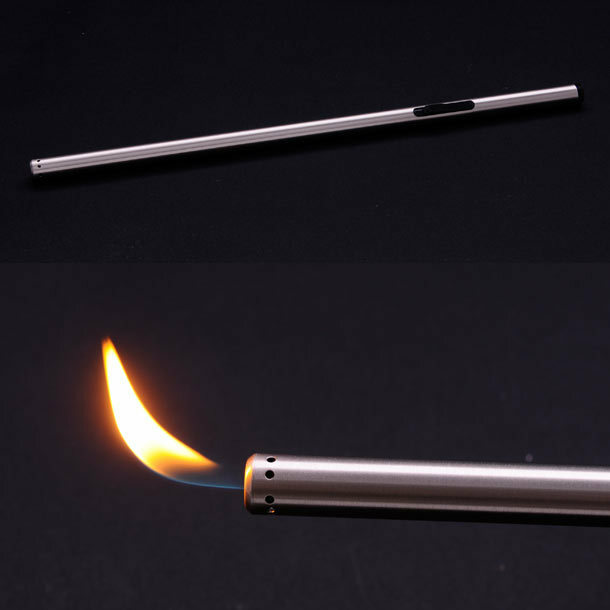 We should use special lighters equipped with an elongated igniter, preferably made ​​of stainless steel. Thanks to the elongated shape we can bring the fire closer to the burner with a fuel tank from a safe distance without worrying about getting burnt. The handle is moved away from an open fire. Lighters with the length of 35 cm at minimum should be used to light the ethanol fireplace. Therefore, even the instant fuel ignition will not expose us to getting burnt.